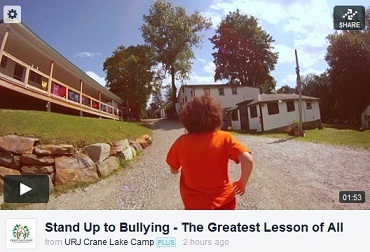 When the Olim unit watched the movie “Bully” in the beginning of the session, it really touched all of us. What we viewed shocked, confused, and startled many of us. The brutality of the bullies and the sheer ignorance of the school principals made me grateful to not be in such a position at home. However, in our reflection session, I was astounded to discover that there were people who either had friends who were bullied, or who were bullied themselves. This session, which contained both campers and counselors, unified us and made us realize that camp truly was a safe haven, free from the fear the real world can bring. A few weeks later, David Long, one of the parents of a victim in “Bully,” came to speak to us. My bunk mates and I did not know what to expect. What I know I did not expect, though, was when Mr. Long had everybody stand; he then asked everybody who had never been bullied (ever in their entire lives), to sit down. No one sat. This was moving; seeing about 30 Olim campers with a dozen counselors and the 32 Machon (counselors in training) all standing was incredibly powerful. As I looked around at the faces surrounding me, I thought to myself, This can’t be! That person couldn’t have been bullied. That person would never be bullied. That person always seems so confident—how could they have been bullied? Yet there we all were, standing with one another, all victims, whether major or minor. That ordeal lasted only a few seconds, but it was one of the most powerful experiences for me. It made me realize what Mr. Long was really trying to say: we need to end this. We need to change our generation, and we need to be upstanders, not bystanders, so we can put an end to bullying one another. We are all safe at camp, which I am eternally grateful for. But not everyone has such a loving, supportive community, so we need to bring the security we have to our homes. Everyone will be going to different states, towns, and schools at summer’s end, but it all starts with one. If every single person started as one, it would grow into a movement. This is what the Long family has started, and I believe now more than ever that the individuals at this camp can go home and do something powerful outside of our bubble. Seeing Mr. Long made this experience real and powerful. His inspiring words and his courage turned a touching film into a moving passion. Bullying needs to be stopped. Because of Mr. Long’s message to Crane Lake, I believe we can be a part of the movement to end bullying. If we can do it together here, we can do it together at home.